chocolate chip cream recipe with step by step photos . 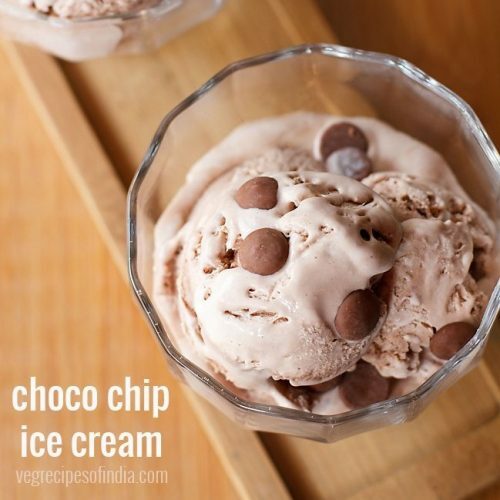 this is an easy recipe of a creamy and smooth choco chip ice cream. does not need any ice cream maker. first take all the ingredients and keep them ready. take milk in a pan or in mixing bowl and keep it on the stove top. heat the milk. no need to boil. place the pan or bowl down. add cocoa powder and whisk till all the cocoa powder dissolves in the milk. now add condensed milk and mix very well. next add brown sugar. mix again till the sugar has dissolved. if the sugar has not dissolved, then heat this mixture lightly on a low flame and stir continuously till all the sugar dissolves. or you can add sugar first and then add condensed milk. keep this mixture aside. let this chocolate mixture cool at room temperature. take chilled cream in a stand mixer and begin to whip it on high speed, till stiff peaks. you can also use an electric beater to whip. whip till you get stiff peaks. the cream will increase in volume and when you turn the bowl down, the cream should not fall. or when you take the whipped cream in a spatula or spoon and turn it down, the cream won't fall. then add the chocolate mixture. now gently and with light hands, fold the chocolate mixture in the whipped cream. do not mix, but fold it. the cream should not loose its peaks or volume and fall flat. so fold gently and slowly. now add the ice cream mixture in a container or box. you can decorate with some choco chips if you want. close the lid tightly and keep the ice cream container or box in the freezer. freeze for 8 to 9 hours or overnight or till the ice cream is set. before serving, remove the ice cream box from the freezer and let it sit at room temperature for a few minutes. then scoop out ice cream with an ice cream scooper. if you are not able to scoop the ice cream easily, then let the ice cream be at room temperature for 5 to 6 minutes. if its too hot where you live, then a couple of minutes is fine. serve choco chip ice cream in bowls or cups. you can also drizzle some chocolate sauce on the ice cream if you want.